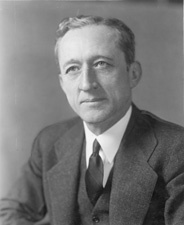 HATCH, Carl Atwood, a Senator from New Mexico; born in Kirwin, Phillip County, Kans., November 27, 1889; attended the public schools of Kansas and Oklahoma; graduated from the law department of Cumberland University, Lebanon, Tenn., in 1912; admitted to the bar the same year and began practice in Eldorado, Okla.; moved to Clovis, N.Mex., in 1916 and continued the practice of law; assistant attorney general of New Mexico 1917-1918; collector of internal revenue 1919-1922; district judge of the ninth judicial district of New Mexico 1923-1929; member, State board of bar examiners 1930-1933; appointed on October 10, 1933, as a Democrat to the United States, and subsequently elected on November 6, 1934, to fill the vacancy caused by the resignation of Sam G. Bratton; reelected in 1936 and again in 1942 and served from October 10, 1933, to January 2, 1949; was not a candidate for renomination in 1948; best known as author of the Hatch Act of 1939 and 1940, preventing federal employees from engaging in political activity; chairman, Committee on Privileges and Elections (Seventy-seventh Congress), Committee on Public Lands and Surveys (Seventy-seventh through Seventy-ninth Congresses); appointed United States district judge for the district of New Mexico 1949-1963; retired; died in Albuquerque, N.Mex., September 15, 1963; interment in Fairview Park Cemetery. American National Biography; Dictionary of American Biography; Porter, David. Senator Carl Hatch and the Hatch Act of 1939." New Mexico Historical Review 48 (April 1973): 151-61.